Some amazing stuff happening in data visualization... I wonder when Toronto will be next? Here's a presentation by Adrian on his open-source innovation that will hopefully revolutionize news gathering at a local level. "It's all about data visualization" is my favourite quote from Adrian. Where were you during ChangeCamp in Toronto? ChangeCamp was held on January 24 2009 at the MaRS Discovery District on College Street in Toronto, Ontario. It was a first conference of its kind, addressing governance in the age of participation. Probably over 200 concerned citizens, government employees, and Canadian digerati where there, on a blustery Saturday morning. There is a ton of information online at the website, the wiki and #changecamp on Twitter. I have never seen so many people with cameras and laptops of all sorts documenting the event. The un-conference organization allowed many voices to be heard and attract interest for everyone's agenda. It's great to see so many people concerned about governance in this day and age. I think Obama-fever is coming north here to Canada! And it's a virus we actually want to spread! Mark Kuznicki and his gang did a great job organizing the event. My turkey Tim Horton's sandwich was missing half a sandwich -- who stole the other half? The layout of the break out tables spread through out the lobby and didn't allow for equal distribution as people swarmed around the tables that had many folks, and those tables were near the entrance to the hall. Tables J through P didn't get nearly as much attention unfortunately. Better use of the main hall probably would be better way to organize the event rather than pushing people out into the hallways and eating spaces of MaRS. There could be a way to vet the session ideas before the event to allow for a smaller set of sessions with more concentration at each -- maybe a uservoice/Google Moderator approach? If you missed it -- lots of video is available online at YouTube -- here's a sampling below. It's always nice to receive a thank you letter for volunteering. We received a letter from Lisa and Greg thanking us for the work we did. As you can see there is a call for feedback as well -- so if you have any good ideas for Little Geeks feel free to visit their website and let them know. 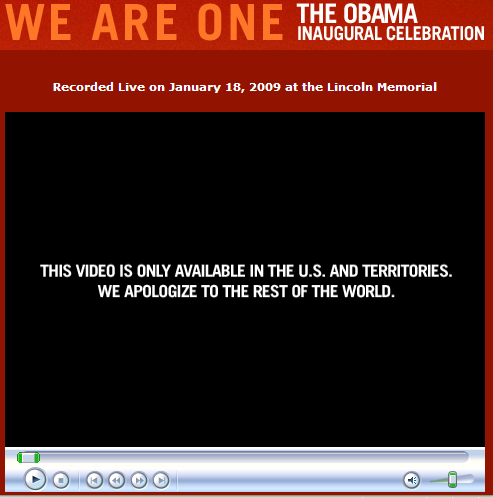 The wording on the video for the "We are One" concert looks like it is taking responsibility for a bit more than it needs to. It's ok, HBO, you don't need to apologize to the rest of the world. You may want to instead explain why a free concert is not simply available with a Creative Commons license. Jennifer Bell is the Executive Director of VisibleGovernment.ca -- a new organization founded to support open government in Canada. She has written an excellent 10 page paper on the topic and uploaded it to scribd.com. Also please note that open government will be the focus of ChangeCamp on Saturday, January 24. There are over 70 people signed up already according to the coordinator Mark Kuznicki and many more will be there. Dan Howard is moving to Victoria BC with his significant other, Jen. Just got the word this morning. He mentioned this organization to me. Sound familiar? Their website is very design-y. Anyone know these folks? The Movement Expands from THE MOVEMENT on Vimeo. The government of Canada has done a bang-up job enforcing the Unsolicited Telecommunications Rules. Well, I guess some things are too good to be true, after all. A bit more transparency and design intelligence on behalf of the CRTC would be greatly appreciated. A 5 year contract with Bell Canada smells fishy too. See the video below that details how you too can grab 600,000 phone numbers in the 416 area code of living breathing, Internet-using people for the low, low cost of $1 per thousand phone numbers ($1CPM). Call or email to remove yourself from the DNC list (I can't believe I am actually saying that). Complaint tetails available on the CRTC website.